"Spock, I've found that evil usually triumphs unless good is very, very careful." Man in conflict with machine is the theme of this episode. Dr. Richard Daystrom (William Marshall) has had a breakthrough in computer artificial intelligence capability and now his device is being installed on the Enterprise. Called M5, the supercomputer is capable of running the entire ship's operations and the plan is to allow it to participate with a skeleton crew in a series of tests and drills with other star ships. Everything seems to be going well at first and Kirk commiserates with McCoy about his place at the helm of the ship if the M5 experiment is a success. Suddenly , M5 purposely goes out of its way to destroy an unmanned freighter and the crew cannot get control of the ship. Ahead is a rendezvous with several Federation star ships for war games that will help evaluate the computer capabilities in such a situation. M5, however, does not distinguish between the reality and proceeds to initiate an attack on its lightly-shielded opponents. There are some problems with the story as it is never really determined what is wrong with the computer that makes it necessary for it to seize control of its own controls. But, the fast-moving plot covers up some of the failures in story to make this a quite absorbing drama. There are deep issues of relating human and machine intelligence that are addressed on both a universal and a personal level. Depth is given to the character of Daystrom as he struggles with the wild, uncontrollability of his own genius and the reflection that is found in the computer he created. Spock is a great admirer of Daystrom's work and the episode starts with interesting counterplay between Spock's defense of the scientist and his aims contraposed with Kirk's natural dislike of the idea of replacing men with machines, especially himself. Unfortunately, the thing missed here was the personality of M5 itself. This episode was made right about the time as 2001: A Space Odyssey. The personality of the intelligent HAL computer on 2001 lends itself to fascinating interplay with the human characters. Here, M5 is very stiff and mechanical in voice interface and this belies the artificial intelligence advance that it purports to be. Still, this episode is ultimately a winner and worth more than one viewing. The story is very believable and suspenseful. I give it a solid three and a half Enterprises. Belonging in the category of Earth parallels, this episode has some metaphor and some allegory mixed into a suspenseful story. The Enterprise encounters a ship that has had its crew wiped out by a plague. Kirk and the investigating landing party are infected and find that they must beam down to the planet to avoid death. Somehow there is an immunizing agent on the planet. Once, on the surface they encounter Captain Ron Tracy (Morgan Woodward) who is the only survivor of his entire crew. He stayed behind as his landing party beamed up to the ship and carried the deadly plague aboard. During his time on the planet, Tracy has found Asian-resembling residents of the village called "Comms" that somehow have grown to be incredibly old. He believes that some naturally-occurring element provides their longevity and he attempts to hold the landing party prisoner and force McCoy to research the agent. Woodward gives a dynamic performance as Tracy, who gets the better of Kirk several times. Woodward is one of those rare actors who played two different guest characters on the show, having portrayed Dr. Simon Van Gelder in Daggers of the Mind. Kirk will have none of it and things he finds about Tracy's time on the planet forces him to battle against his plans. The residents of the village are under siege from a band of wild, savage enemies called "Yangs" and Tracy has been participating in the fight against the Prime Directive. Tracy throws Kirk into a cell with one of the savages, Cloud William, played with sturdiness by Roy Jensen. This is a good episode for action and that certain "twilight-zonish, wouldn't it be weird if?" kind of feeling. As with many other of the Earth parallel ilk, there are definite illogical aspects to the story and conclusion, but this show is still very interesting and satisfying viewing. It is not often that we get both a solid story and a bit of allegorical whimsy in one television show and this one deserves three Enterprises. 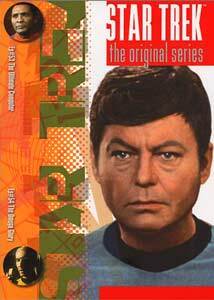 Image Transfer Review: The image transfers in the Star Trek collection continue to be an impressive effort. Paramount has done a nice job again here with the color transfer, the Enterprise bridge and other interiors and skin tones are marvelous. Once again, there are minor defects and the unfortunate fact that the clarity of the image reveals the primitive nature of special effects in that era, but it is still awfully good viewing. Audio Transfer Review: Another nice job on the audio. It's not your up-to-date soundtrack, but it provides subtle expansion of the sound across the stereo spectrum. A nice, faithful track with some decent upgrades. Extras Review: Each episode comes with the standard subtitles and original television teaser. The informational booklet provides the usual amount of trivia and info about the episodes (not much). Two very good episodes on this disc, both overcome some inherent illogic to provide solid entertainment. The Enterprise is fitted with the latest in artificial intelligence and the members of the crew grapple with man being replaced by machine. In the second, a misguided ship's captain attempts to lure Kirk into a plan to offer a fountain of youth to the galaxy. This release is definitely in consideration as an "essential" disc.